In an attempt to expand the appeal of the 2009 Dodge Challenger to every corner of the automotive enthusiast world, Chrysler has unveiled the Mopar Drift Dodge Challenger that will be piloted by Samuel Hübinette during the 2009 Formula Drift season. In order to prep the car for FD, the Challenger dropped a significant amount of weight with the use of carbon fiber everywhere and received a bit more safety equipment than your average SRT8. 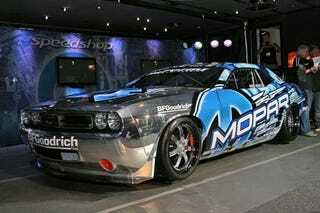 Under the hood is a custom-built Mopar A8 aluminum engine that should pump out 850 horsepower and 849 lb-ft of torque. They've also installed a minor tweak in order to let them drift along the walls, which we highlight below the jump. That's right, those are roller blade wheels. Carbon fiber gets expensive and rather than just replacing the paint on the rear of the Challenger those wheels should help the muscle car smoothly glide on 1990s technology. Maybe a Moon Boot-based system may end up on an off-road Ram. Let's just hope they'll also have a Dodge Ram full of tires to tow it around. Details from Chrysler below.